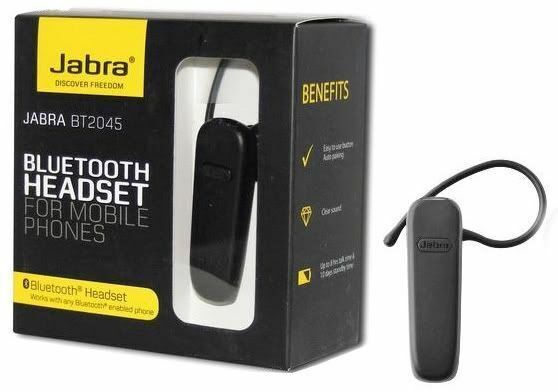 The Jabra BT2045 Headset features a single earpiece with in-ear ear-bud design and an ear-hook fit. It incorporates a built-in microphone with mute button, playback and volume controls, and noise cancellation for quality sound. The headset allows connections via Bluetooth and is compatible with a range of devices including Apple and Samsung brands. It contains a rechargeable battery, is water resistant, and allows wired connections via USB and Micro-USB. This is my 3rd Jabra earpiece - only because I have lost or broken previous ones. I've had other brands - but I absolutely love the Jabra - it's no frills and practical. It is my preferred Blutooth device as they are excellent value and have fantastic clarity and ease of use, plus amazing battery life. In fact, I think they have even improved the battery life with this latest model as it seems to keep on going! I also note that the ear rubber has also been improved as I had trouble with previous models popping off. What can I say I seriously love this earpiece! Best buy, excellent device, easy to use. Sound is very clear. I love it,i use it every day. cathces outside noise more rather than person voice!! cathces outside noise more rather than person voice!! gives lots of disturbance! !